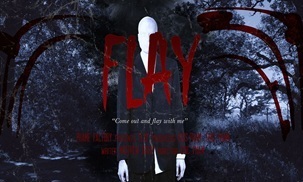 Austin film Production Company, Phame Factory’s Director Eric Pham, is currently in production with his second feature film titled FLAY, a contemporary retelling of a Japanese and Native American folklore figure that “Flays” the face of his victims and who has a striking resemblance to Slender Man. Pham’s goal is to make a “Smart and Scary” horror film, which features a modern day boogeyman. His cast includes Elle LaMont (Machete Kills), Michael Baldwin (Phantasm series), and Dalton Gray (Dumb and Dumber 2). Dir. Eric Pham’s previous is entitled (Action News Five). Pham’s list of visual effects include: SPY KIDS, SIN CITY, GRINDHOUSE, and many more. Shooting will continue to take place in and around the Austin area through the 29th will conclude with multiple days at Hill Country Middle School. Phame Factory has already two more feature films in development including one that they aim to shoot January 2015. FLAYS likeness is bound to make audience white with fear! (Left to Right) Elle LaMont as Moon Crane and Johnny Walter as Tyler Foreman. (Left to right) Violett Beane as Bethany, Kaylee King as Chrissie, Noe de la Garza as Hector, and Dalton Gray as River Crane. (Right) Elle LaMont as Moon Crane. Behind the scenes on Flay. Michael Baldwin of The Phantasm Film Series playing Billy Salcedo. Flay is a Phame Factory production. Directed by Eric Pham. It stars Elle LaMont (Machete Kills), Michael Baldwin (Phantasm series), and Dalton Gray (Dumb and Dumber 2).